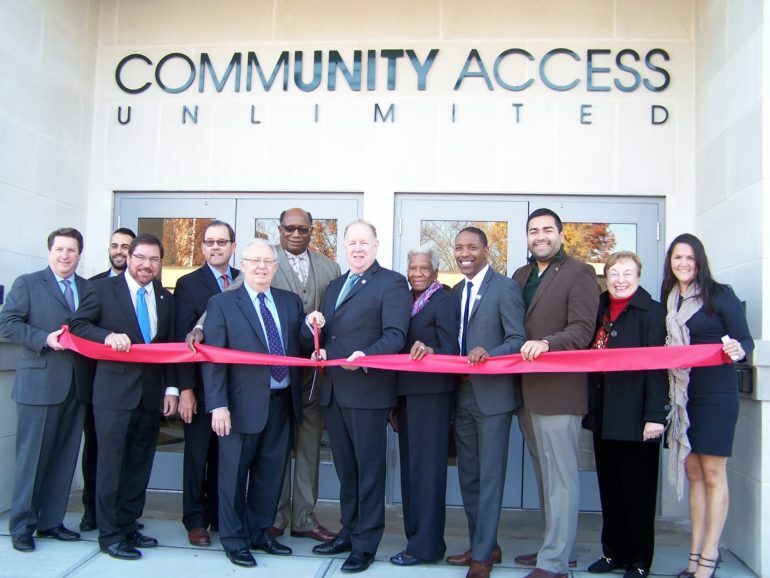 For all of the pride that comes with opening a new cutting-edge headquarters building, Harold Poltrock can’t forget the humble beginnings of Community Access Unlimited. He recalls meeting its founder, Sid Blanchard, more than 30 years ago when the Elizabeth-based nonprofit was in its infancy. At the time, Blanchard’s office was so cramped that they would retreat to a nearby deli to escape the blare of the building’s elevator. And while CAU’s footprint has grown exponentially since then — it now stretches the length of a block on West Grand Street — Poltrock said the organization’s mission has never changed. That pride was on display last week as the organization, whose services include support programs for adults with disabilities, opened a new 60,000-square-foot headquarters in Elizabeth. The five-story, $11 million building features office space for both CAU and local businesses, including Poltrock’s law practice, along with community spaces such as a 400-seat auditorium on the ground floor. Poltrock noted that CAU has grown over 37 years, from the trunk of Blanchard’s car to a tiny basement office on Prince Street to a building that’s adjacent to the new headquarters on West Grand Street. He said Blanchard operates the agency with business savvy and a private-sector developer’s approach, allowing it to expand its services and its footprint successfully. The agency serves more than 6,000 people, which it refers to as members, many of whom are counted among CAU’s more than 1,200 employees. And Poltrock noted another important change from CAU’s previous headquarters: In the older space, gathering points for members were confined to the basement and other seemingly out-of-the-way areas. The new building is decidedly more integrated, he said, thanks to attractive spaces such as the first-floor auditorium and second-floor café and member chat room. A ribbon-cutting for the new headquarters, which was built by Woodruff Developers and designed by James Guerra Architects, drew a crowd of local officials who have long supported the agency and the new facility. They included Elizabeth Mayor Chris Bollwage, Union County freeholders Sergios Granados and Vernell Wright and state Assemblyman Jamel Holley. The event also included the presentation of a $10,000 grant to CAU from Valley National Bank. “We are proud to support Community Access Unlimited in their mission to provide opportunities for individuals with disabilities to live independently and lead productive lives within our communities,” said Mwaura Muroki, vice president with Valley National Bank.